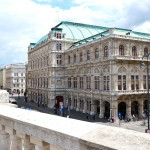 Most people associate Vienna with the impressive buildings of the Ringstrasse and the historical buildings of the old town. Meanwhile, the Austrian metropolis hides many unusual buildings that are considered to be works of art or, on the contrary, are sometimes regarded as kitsch and simply ugly. 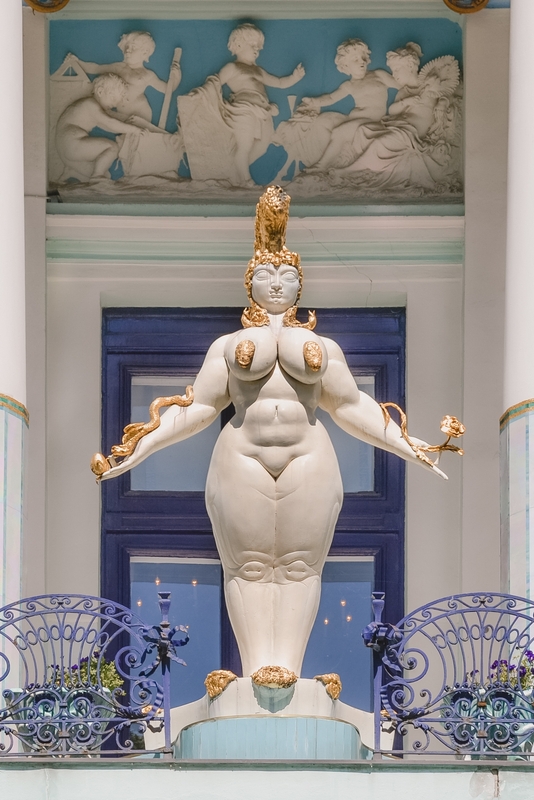 I present to you a subjective list of 10 strangest buildings in Vienna. Which of them seems amazing to you and which in your opinion could disappear from the city map? Which building in Vienna do you consider the strangest and the most bizarre-looking? 1. The Hundertwasserhaus, the most bizarre-looking building in Vienna. 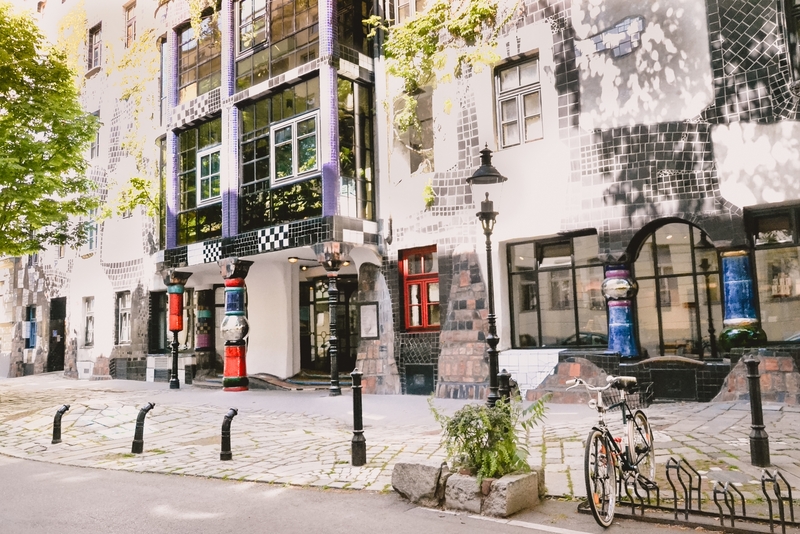 The Hundertwasserhaus is one of Vienna’s most popular attractions. Every day, crowds of tourists visit this place taking pictures of the colorful facade. Some people like Hundrtwasserhaus very much, others consider it ugly and kitschy. Its creator Friendenserich Hundertwasser hated straight lines and angles, he was an ecologist and the buildings he designed are a combination of architecture and nature. The Hundertwasserhaus is one of the artist’s most famous works and is considered the most eccentric municipal building in Vienna. The house has 50 apartments, each of which has been mapped on the facade with a different color. In addition, two children’s playrooms and four commercial premises are located here. On the roof of the building, there are 19 gardens, in which 250 trees and shrubs grow, and a golden church crown. It is interpreted as “the crown of the inhabitants of the house”. An interesting fact is that Hundertwasser did not accept payment for designing the house. Instead, he wanted the City Council of Vienna to promise him that nothing that he considered ugly would ever be built in this place. Since the residents of the Hundertwasserhaus were tired of the constant visits of tourists, the car service station opposite the house was transformed into the Hundertwasser Village. Thanks to this, space was created in which tourists can take a walk on the famous curved floors, sit at the bar on which the stream flows, go to the bizarre-looking toilet in the underground or buy some souvenirs. 2. 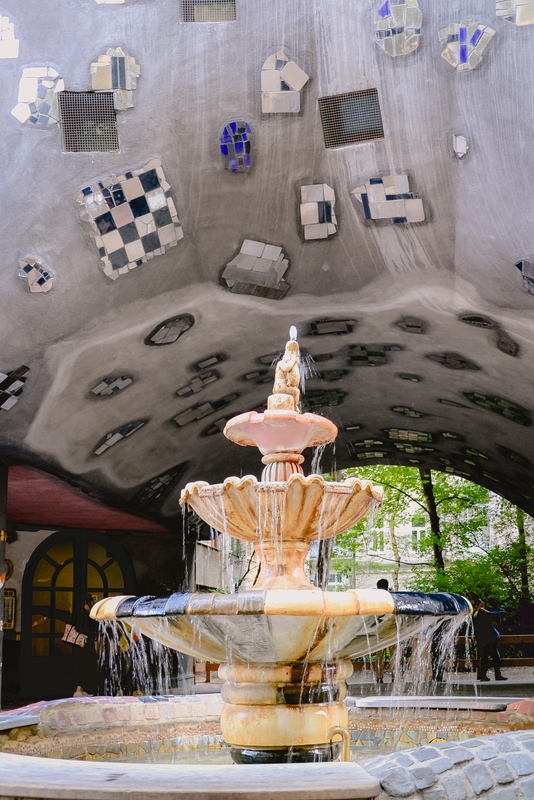 The KunstHausWien, the museum of Friendensreich Hundertwasser. 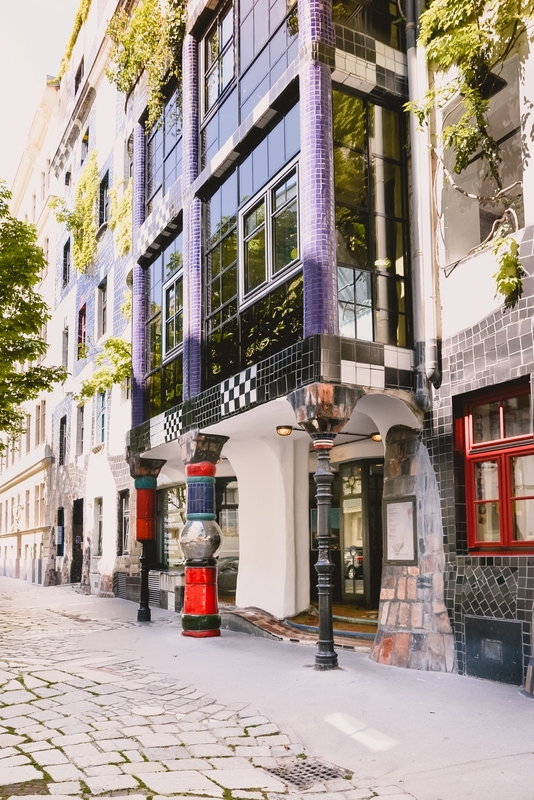 Not everyone knows that only 5 minutes walk from Hundertwasserhaus the second building designed by the same artist is located. 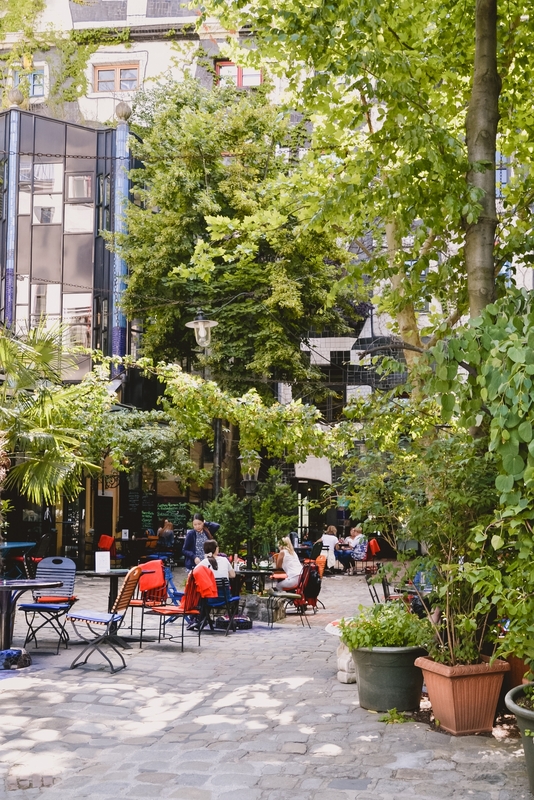 It is the KunstHausWien, which houses the Friedenreich Hundertwasser’s museum and a nice cafe in an ivy-covered courtyard. The KunstHausWien building was created as a result of the adaptation of the former Thonet furniture factory and represents the artist’s typical style: curvatures, uneven floors, a facade decorated with mosaics and plants being an integral part of the building. Some say the KunstHausWien is a more conservative version of the Hundertwasserhaus. It was built a few years later and is not so popular, but many people consider it to be a better-looking one. I think it is worth to see both strange Hundertwasser houses and see how the artist’s style evolved. 3. 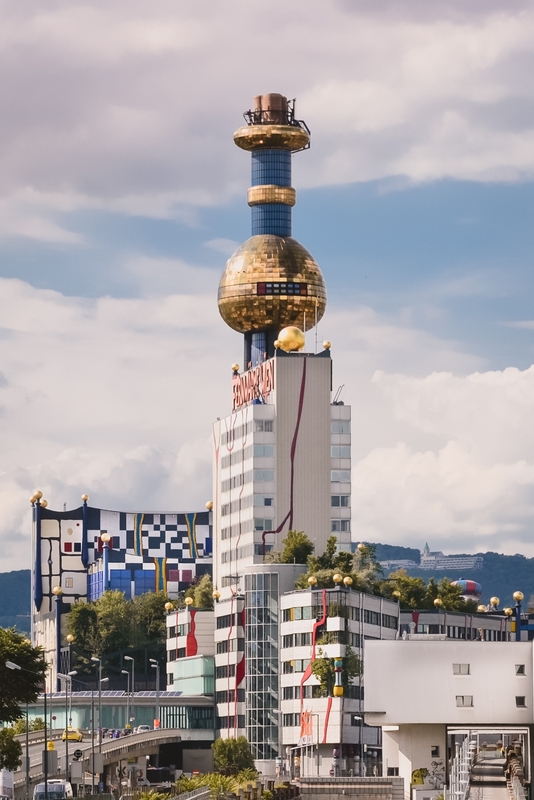 The Spittelau, the municipal waste incineration plant designed by Hundertwasser. 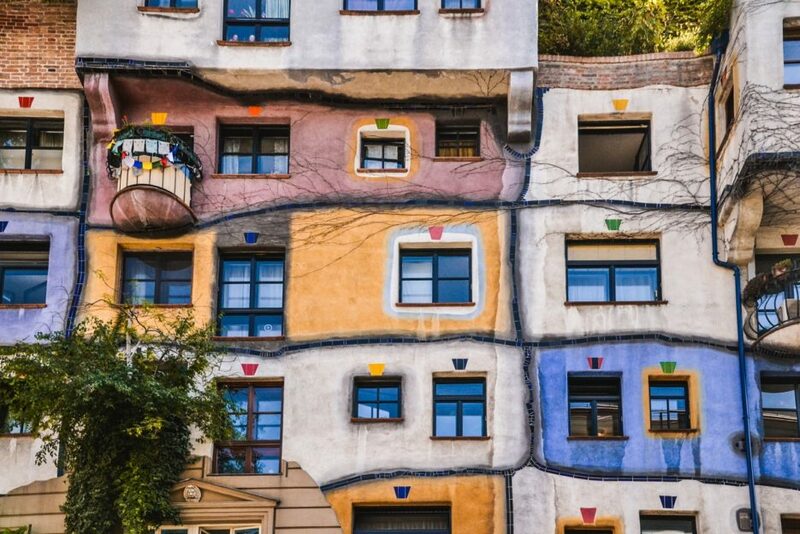 The Spittelau is another thing in Vienna designed by Friendensreich Hundertwasser. 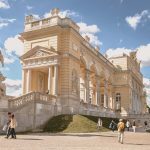 Many tourists are surprised by the news that a strange looking building with a golden dome is … a municipal waste incineration plant! Why did the ecologist decide to design it? The Spittelau has always been controversial and its creation was against the will of both ecologists and the local people. After a fire and many public discussions, the garbage incineration plant was rebuilt and equipped with the most modern technologies. As an environmentalist, Friedensreich Hundertwasser was against the idea of reconstruction of this plant. He was of the opinion that such objects emit a lot of harmful pollutants into the atmosphere. He was finally convinced when he visited Spittelau and saw the innovative, environmentally friendly technology that was used. Then he not only became a supporter of the reconstruction of the Spittelau but also decided to design the building himself. 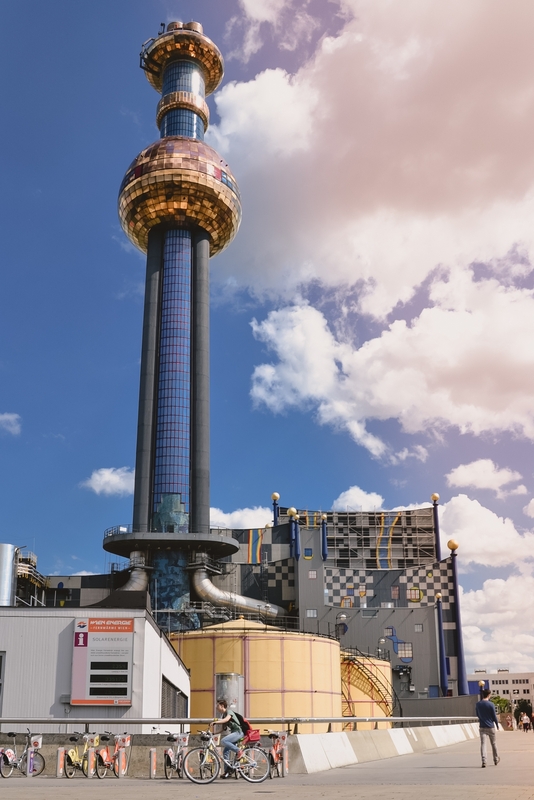 Currently, the artistic facade of the municipal waste incineration plant Spittelau is one of the ecological symbols of Vienna. 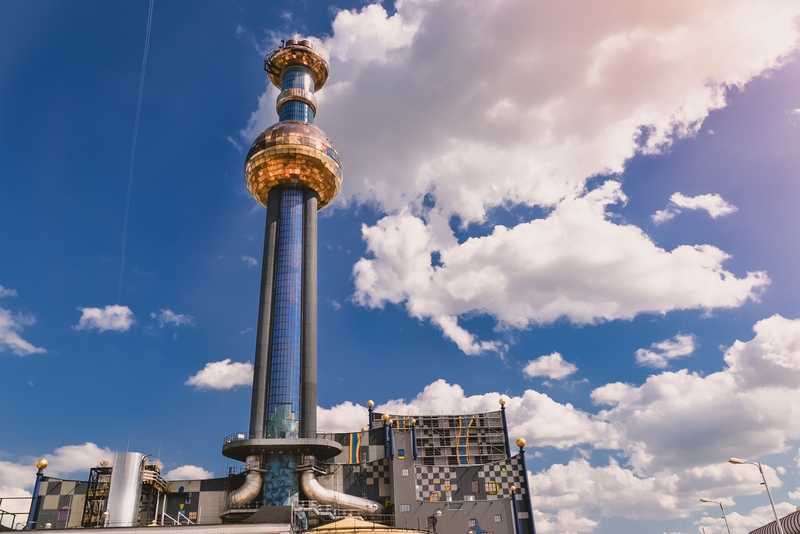 The tall blue chimney with a golden dome, like from the ‘Tales of the Thousand and One Nights’, catches the eyes of passers-by, while the colorful mosaic and bullet-topped turrets complement the works. 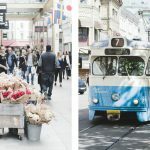 Emission of pollutants is under constant control, and its results are presented to residents on light boards located in several points of the city of Vienna. 4. The Vienna Peace Pagoda, the Buddhist temple at the Danube. People are usually surprised when they find out that on the outskirts of Vienna there is the Buddhist temple. Vienna Peace Pagoda (Friedenspagode Wien) is located on the bank of the Danube, in the green Prater area. The Japanese religious movement that uses the Viennese pagoda was created after dropping the bombs on Hiroshima and Nagasaki. If you want to show respect for the temple, you should first stop with the folded hands in front of the Buddha statue, and then go around the temple three times clockwise. Then you can light a few incense sticks. 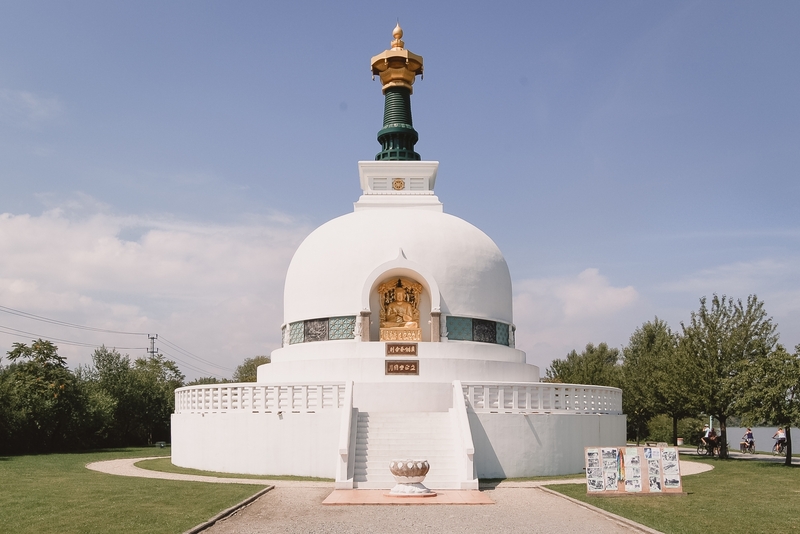 You can also get to the Vienna Peace Pagoda by bike. Vienna City Bike stations are located at the U2 U-Bahn stations (Krieau, Stadion). 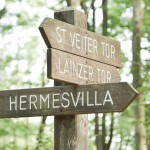 The route is very pleasant because it leads through the green area of Prater Hauptallee, in the shade of chestnut trees. 5. 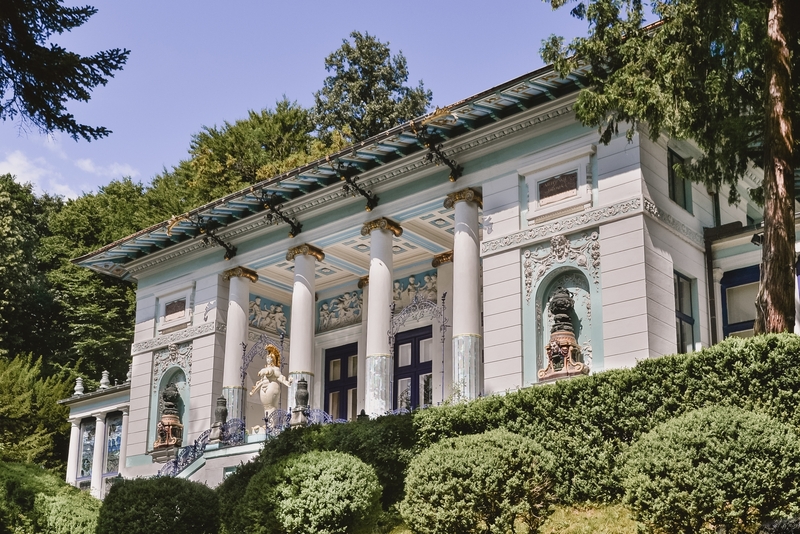 Villa Wagner I, the Art Nouveau hidden gem on the outskirts of Vienna. 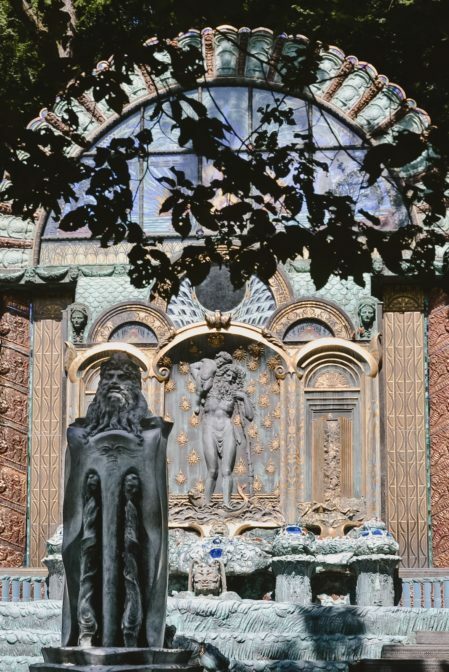 Not everyone knows that on the outskirts of Vienna there is an impressive Art Nouveau building, Villa Wagner I. Its creator was Otto Wagner, the famous Viennese architect. Some wonder that he has designed such a thing because the building is completely different from his other works like Karlsplatz Stadtbahn Station, Majolica House, Postal Office Savings Bank Building or Kirche am Steinhof. Villa Wagner I is very fancy, colorful and well, some may seem a bit kitschy but nevertheless, it’s a very interesting building. Currently, the villa houses the museum of Ernst Fuchs, the painter who in later years lived and created here. On the left side of Villa Wagner I there is a path that leads through the forest to the viewpoint from which you can admire a very nice panorama. 6. The Republic of Kugelmugel, the micronation at the Vienna Prater. 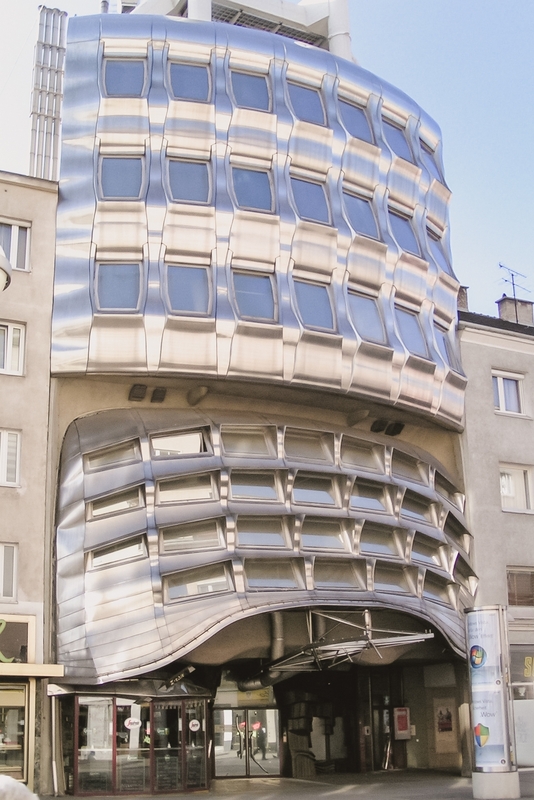 The Republic of Kugelmugel is undoubtedly one of the strangest buildings in Vienna. First of all, its spherical shape is quite unusual, and secondly, it has a very interesting history. In the 1970s, the Republic of Kugelmugel was declared as a micronation. How did this happen? The name Kugelmugel literally means the ball on the hill (‘Kugel’ means ‘ball’, ‘Mugel’ can be translated as ‘hill’). The building was designed by the Austrian artist Edwin Lipburger and was originally located in Katzelsdorf, Lower Austria. Lipburger has always dreamed of a ball-shaped house. He even used to say: ‘Everything is round. The earth, life, the ball, everything turns … so why not live in balls? Round is free; it has no beginning or end ‘. Unfortunately, his views did not meet with the approval of the local community. It was considered that the house in the shape of a ball spoils the aesthetics of the town and was planned to demolish it. In response, the artist decided to announce the independent Republic of Kugelmugel, proclaiming himself president of his micronation. Edwin Lipburger also stopped paying taxes and, as a result, spent 10 weeks in prison. 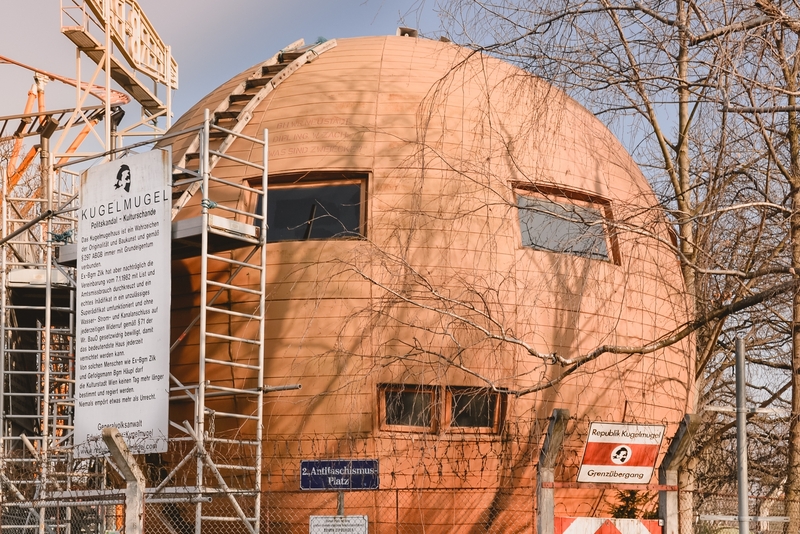 In the early 1980s, after many disputes, the spherical house was moved to Vienna and is still standing near the Prater Amusement Park. The artist changed the address to Antifaschismusplatz (Anti-Fascism Square), fenced the ball with barbed wire and hung his own national flag. Edwin Lipburger passed away in 2015 and his house came into possession of the city authorities. Since then, it has been open to visitors. 7. 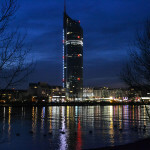 The DC Tower, the modern glass skyscraper on the bank of the Danube. 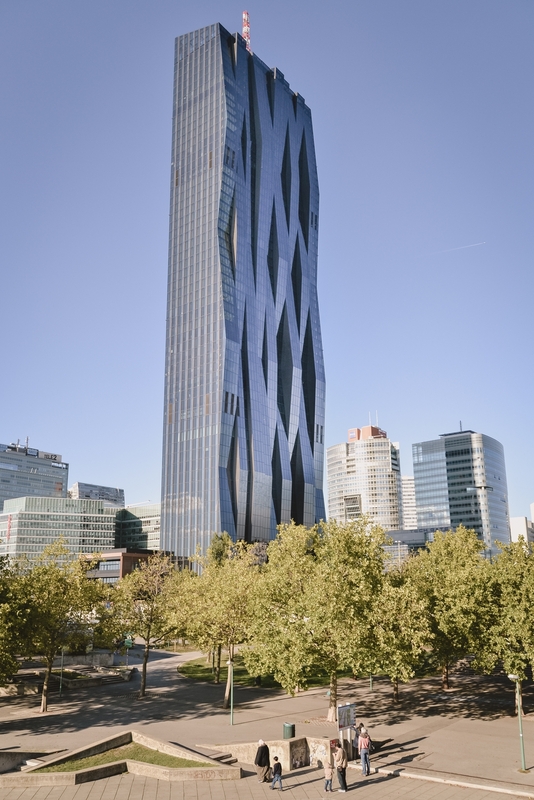 The DC Tower is located on the banks of the Danube, in the modern part of Vienna called UNO City. As I mentioned in my blog post 10 best things to do in Vienna, the Danube did not always look the way it is today. When the river was regulated, new land for development was created. As a result, in the 1970s a complex of modern skyscrapers was built, which to this day we can observe while on the Danube. Relatively recently, in 2014, the construction of the first of two DC Towers was completed, which in the future together will create a kind of gate to this modern part of Vienna. 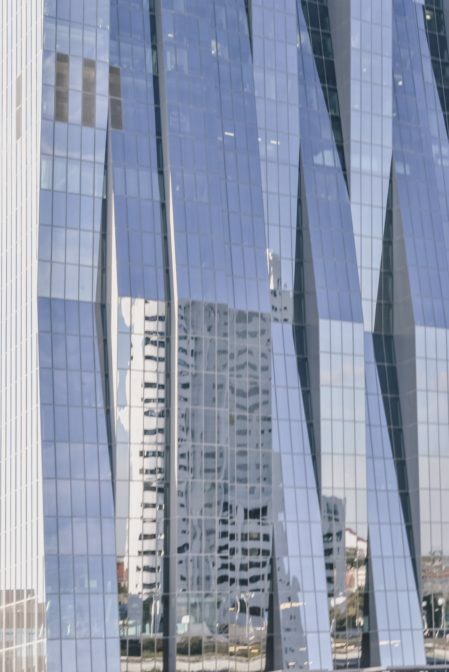 The DC Tower looks impressive and personally, its wavy facade reminds me of the river Danube, which flows peacefully right next to it. The building fantastically reflects light and is perfectly visible from all viewpoints in Vienna. An interesting fact is that the DC Tower is the tallest building in all of Austria. 8. The Domenig-Haus, the strange building that looks like it’s squeezed. Another strange building in Vienna is located in the Favoriten district. Tourists rarely visit these areas, which is why this place is hardly described in guidebooks. Domenig-Haus, because it is called a bizarre-looking building made of stainless steel, gives the impression of being pressed between two neighboring tenement houses. The author is the architect Günther Domenig, and the construction was completed in 1979. Somewhat later, the Favoritenstrasse street, where the building is located, was transformed into a pedestrian alley. The original facade makes Domenig-Haus surprising passers-by despite the passage of time. Some people used to say that this bizarre building looks as if someone had kicked it, or if it did not have enough space, and tried to squeeze in between neighboring tenement houses. There is something in it, is not it? If you are on Favoritenstrasse, it is worth going for a walk from Keplerplatz to Reumannplatz, where you can eat delicious Tichy ice cream and see Amalienbad, which interior is a real Art Deco hidden gem. On the way, you will also pass Viktor-Adler-Markt, which is like a small, non-touristy Naschmarkt (check also: Colorful Naschmarkt). You can buy fresh vegetables, fruits or eat lunch here. 9. The Gasometers, the post-industrial buildings in Vienna. The Gasometers are four post-industrial buildings located in the 11th district of Vienna, Simmering. As the name suggests, their purpose was to accumulate urban gas used to illuminate the streets. When it was decided to switch to natural gas in Vienna, they lost their original purpose. For a time they stood empty and began to deteriorate, but later it was decided to renew them, giving the Gasometers a second life. To this end, in 2001, four architects of international renown were asked to redesign the post-industrial Gasometers. 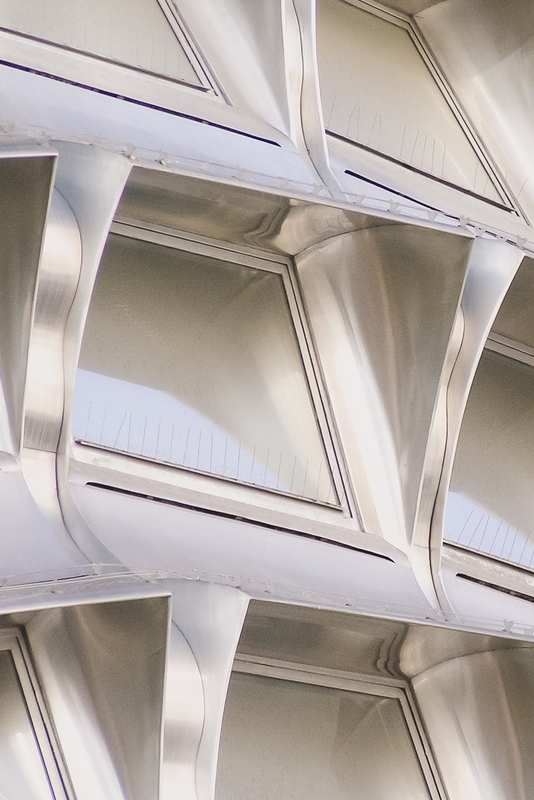 Jean Nouvel, Coop Himmelb (l) au, Manfred Wehdorn, and Whilelm Holzbauer participated in the project. Each of them worked on the renovation of one gasometer: A, B, C, and D. Currently in the Gasometers there are 800 apartments, a dormitory, a music hall, a cinema, and a municipal archive. 10. The Vienna Flak Towers, the anti-aircraft towers from the period of the Second World War. 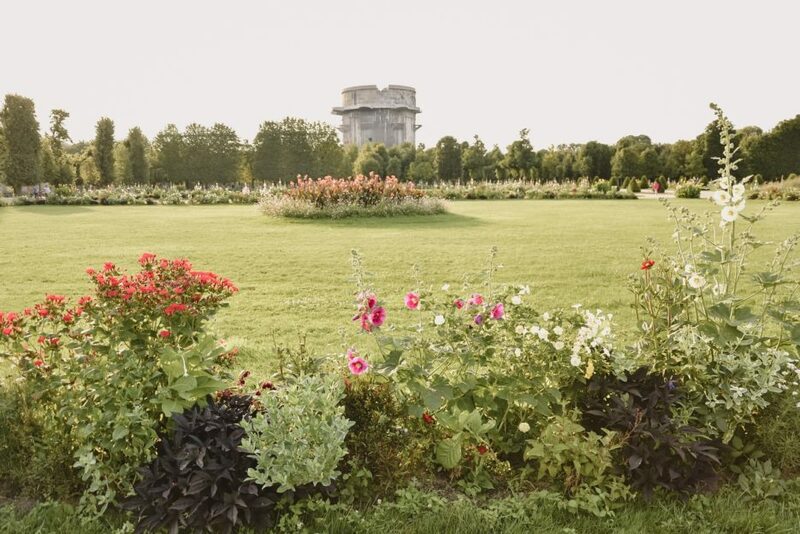 The Vienna Flak Towers are the remnant of the Second World War. In the years 1942-1945, on the order of Adolf Hitler, six anti-aircraft towers were erected in the city. They were to protect Vienna from allied air raids, but due to the rapid advances in technology, they proved useless. 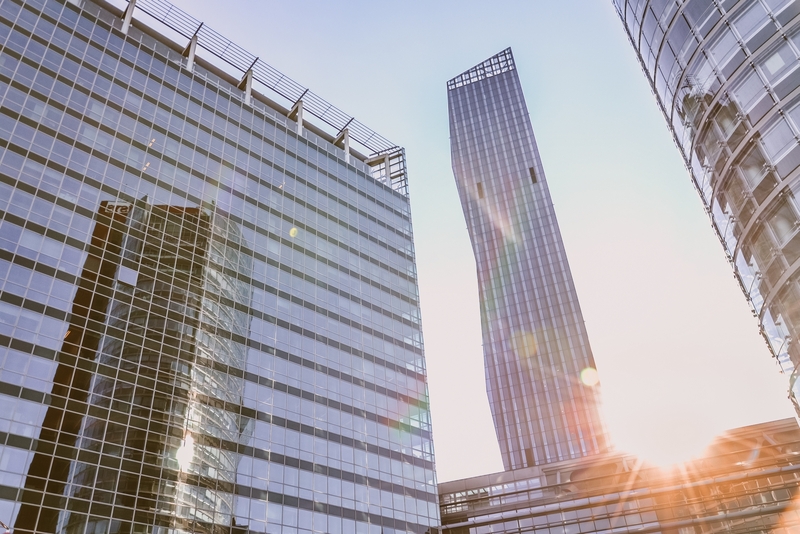 After the war, it turned out that reinforced concrete structures are so strong that it is impossible to demolish towers without damaging neighboring buildings. Now it would be possible, but in the meantime the Vienna Flak Towers were under the protection of a monument conservator. 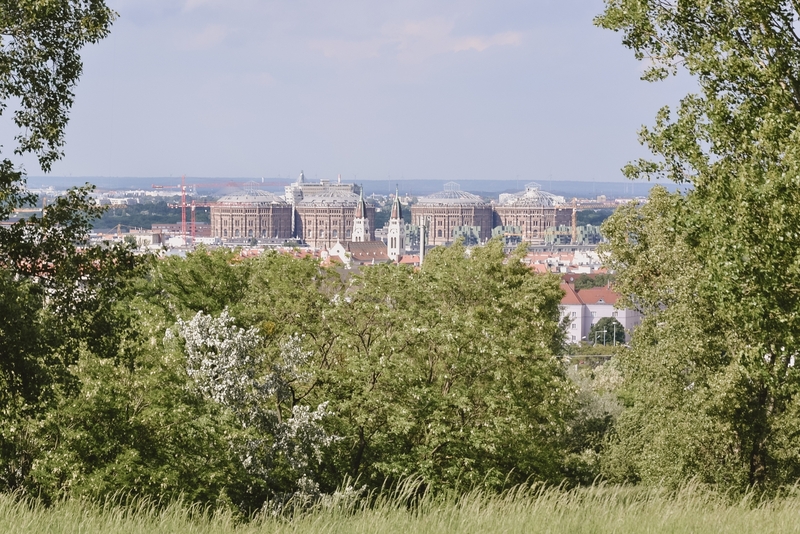 The anti-aircraft towers are located in pairs (one was a measuring and guidance tower, the other attacking) in three points of Vienna: in Augarten Park, in Arenberg Park and at Schadekgasse. An interesting fact is that the towers create a kind of a triangle, in the central point of which is the cathedral of St. Stephen. Only the tower at Schadekgasse has been adapted and now houses the Haus des Meeres aquarium. Other towers create an amazing contrast between greenery and flowers in the parks in which they are located. I feel like Spittelau looked so out of place. I imagine Vienna to be such a cute and charming European city. That building looked more like something you’ll see in China! That’s right, Spittelau is a bit of a startling sight in Vienna. But the building is interesting and I see beauty in it. I wish I knew about your blog when I was visiting Vienna. I love this kind of places, weird, colorful, different architecture. I missed so many great spots. Need to go again one day. 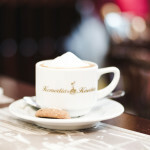 Maybe it will be a good excuse to go to Vienna again? I will tell you honestly that I lived a year there and I still have the feeling that I did not see everything. 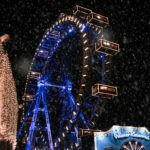 There are a lot of things to do in Vienna, it’s a very interesting city. I always imagine Vienna filled with gorgeous old world architecture. It’s actually quite interesting to see all these other unusual buildings. I will have to add that to my list of things to see in Vienna! It is true that Vienna is mainly beautiful historic architecture, white tenements, old churches, monuments. But there are also many other interesting things here. I think I will write one more blog post about such hidden gems. OH MY! I missed out on most of this buildings when I went to Vienna a few years ago. I did get to see Hundertwasserhaus though! It was very quirky and enjoyed wandering around inside. Thank you for sharing this. In that case, you have no choice but to come to Vienna again and see all those strange looking buildings 🙂 Check out my blog post about 5 alternative things to do in Vienna, maybe you will find there something interesting for yourself. I did not know that Vienna houses so many strange buildings. 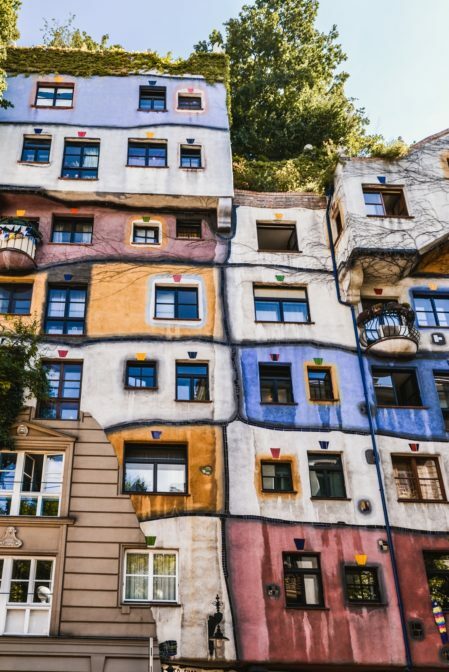 The Hundertwasserhaus is the most beautiful and strange as well at the same time. I understand that tourists flock there because of the way it looks. It is good that the car service station has been changed to Hunderwassert Village so that the tourists can have a look at the place. I also like the other buildings like the Republic of kugelmugel, the peace Pagoda, and also the Domenig Haus which looks really interesting. 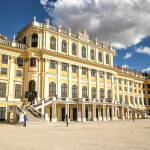 I’ll make sure when I visit Vienna I’m going to visit these places without fail. Hundertwasser is such a local Austrian Gaudi. Honestly, I was very surprised when I saw his buildings in Vienna. They look so unreal and a bit like a fairy tale. Domenig-Haus is a place that few people know about it, just like the Vienna Peace Pagoda. It is worth going there if you want to see something else, not just trivia attractions. Oh nice. With modern construction technologies, people can make really interesting shapes, pity that they don’t use it so often. This is a cool collection of weird buildings. Would love to see them myself. Speaking of modern buildings, in Vienna there is a lot of interesting contemporary architecture. You inspired me to create one more blog post about it. Thanks! These are such interesting buildings. I’d never heard of most of them. It’s so interesting to see the different styles and hear the stories behind them. 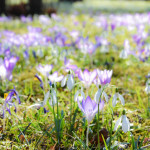 I am glad that my blog post was interesting for you. I will write even more about interesting things in Vienna soon. 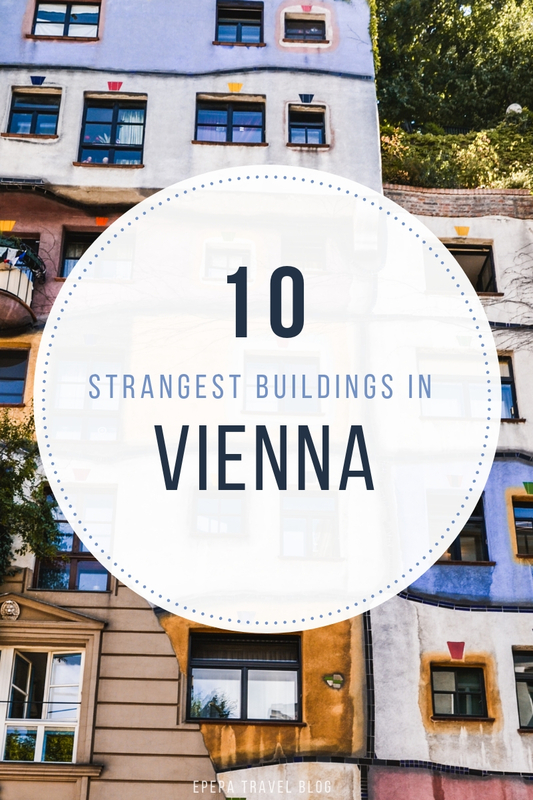 I am not as much in awe of other buildings in the list as I am of Hundertwasserhaus and I am so sad that I missed visiting it when I was in Vienna last year! Looks super cool, I would’ve loved to photograph it myself. Wow, this architecture is so neat! I didn’t really get off the beaten path much and wish I would’ve been able to see these gems. I can’t wait to make a return! How did I miss Villa Wagner?! It’s such a beautiful building, I surely need to go back. I do remember seeing the first wonky building – how can you miss it – but enjoyed its eccentric looking structure. I also missed the peace pagoda, it looks so serene. Do not worry, I keep my fingers crossed that you will go to Vienna and you will see everything I mentioned here. I also did not know about Villa Wagner for a long time, this is not a typical tourist attraction, just such a hidden gem. I love the work of Hundertwasser (there is even one of his designs in New Zealand). 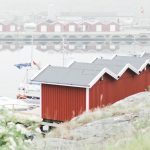 The Republic of Kugelmugel has caught my eye and the story behind it makes it my favourite on your list. I read that Hundertwasser loved New Zealand and there is his grave there. His biography is as interesting as his buildings. The history of the Republic of Kugelmugel is really interesting but hardly anyone knows about it. Personally, I appreciate that the artist defended his vision with such determination despite the opposition of the authorities and everyone around him. It’s inspiration. They are indeed find strange and interesting. It means that Vienna has diversity and showcased many of these structures. That’s true, there are many interesting things in Vienna. All you need to do is walk away from some typical tourist places to find something extraordinary. Hi there! Thanks for sharing. Despite my many visits to Austria, I have not seen many of these strange but innovative buildings. I will definitely have to check it out for any future visits!